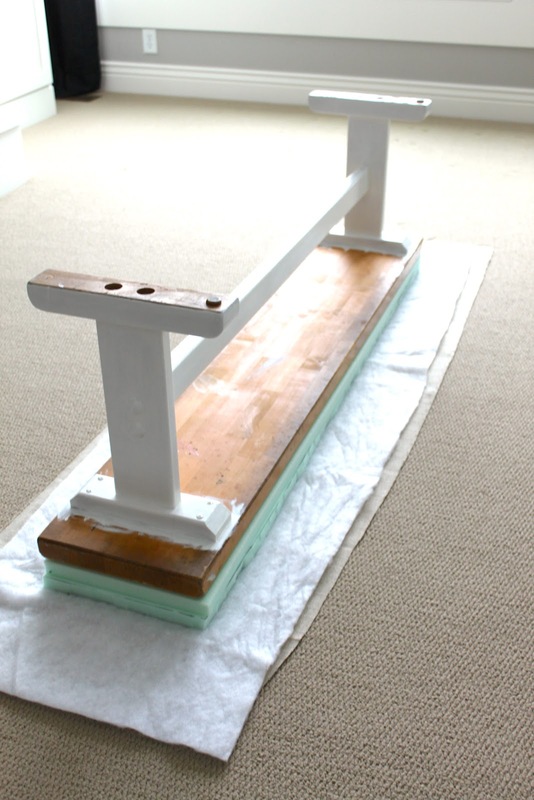 Once I finished making the Guest Room Headboard (click here for more on that DIY) I knew I needed a bench for the foot of the bed. Benches aren't too cheap if you buy them brand new. I considered making one but then the heavens opened one day at my local thrift store and I saw this beauty for the great price of just $10! I contemplated the decision of buying it and bringing it home for all of about 1 second! It was pretty beat up on the top but that was fine with me- I had plans to cover that up anyway. I saw this idea on Centsational Girl and it was pretty easy overall following her directions. After painting the legs white, I got to work upholstering the top. I ended up buying a piece of foam that was just 1" thick but wide enough that I could cut two pieces and stack them to give me a 2" foam seat. It was a little cheaper to do it that way. My foam was 1x24x72 and was on sale for 50% off so it cost $17.99. I already had the batting left over from the headboard project. I used the same material as the head board- I unfortunately had to buy 2 whole yards to cover the 5 ft. length of the bench but it did leave me enough leftover material to upholster another bench if I so desire (you know I will!). The cost for 2 yards of this fabric was $30. I then added a roll of Nail head trim from JoAnn's (reg. $20 but on sale for $10). So total cost for the project was $70, more than I wanted to spend (because of the fabric- but again I can now make another bench without having to buy more fabric). That's some expensive fabric. Specially besides what you paid for the other items necessary to do this. But it is an amazing looking one and I'm sure it will wear so nicely that you won't regret what you paid for it. That bedroom is turning so lovely. Cosy. Like everything you put your mind, and hands, in. That gray throw on your bed is yummy! And the bench looks great!! What an amazing guest room! The bench adds the perfect touch.